ID: 443 ~ Source: Image courtesy of Andrew Feight, Ph.D., from the Scioto Historical Series, private collection, Friendship, Ohio. ~ Creator: Andrew Feight, Ph.D. 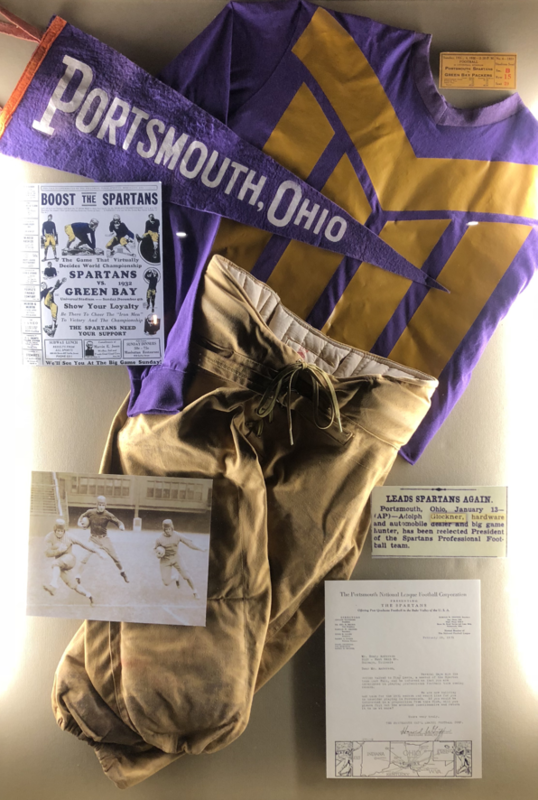 Known as the "Purple Herd," the NFL Spartans wore purple, as seen in this replica of a Spartan uniform, which along with other Iron Man Game memorabilia is on display at the B. Glockner Building on Market Street in Portsmouth, Ohio. A newspaper article on display notes that "Adolph Glockner, hardware and automobile dealer and big game hunter, has been reelected President of the Portsmouth Spartans Football Team."